Now we’ve covered ideas of love and intimacy, and it’s time to bring it all together into something that makes it more useful to talk about with others. My goal is to construct a model of the way a person sees a particular relationship, and use that to get a sense of where things are now, and where they’d like them to end up. It’s a tool for managing goals and expectations in a way that’s comprehensible to everyone involved, and it starts with a chart. Here it is, in all its glory. Well, I’m a philosopher, not a graphic designer. The functionality is there, and it’s easy enough to make your own, so you won’t have to buy mine for $4.99 a pack. The first think you’ll notice is that there’s no numbers. That’s because it’s not useful to rate these things on a numerical scale. Instead, when you want to mark an assessment or a goal, mark the spot on the line and write what it is right beside that. When you come back to it, you’ll know why you thought what you thought, and that will have more of an impact than a number. 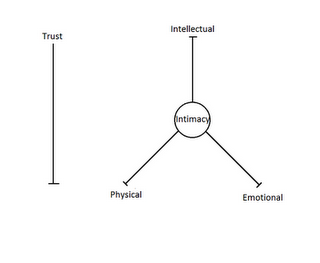 The trust scale moves vertically, because trust can go up or down, but the three kinds of intimacy go inward, with greater intimacy being deeper. Also, always write in pencil. You’ll likely want to go back and re-evaluate some things before you’re done. To use it, start by assessing your current level of intimacy by marking the point where you feel it falls on the line for each type. The deeper it is, the closer your mark should be to the centre circle. Write down what you think of when you think of that level of intimacy, and try and attach it to a specific memory or set of memories with the person. The goal of this exercise is to encourage introspection and help you better communicate why this is the way you see the relationship now. Here are some good questions to ask when trying to assess intimacy. When have I been most comfortable with them? What is the most important thing I’ve shared with them? How did I feel after sharing that? Next, assess your current level of trust by marking the line. The key question to ask yourself when assessing trust is “What would I share with them without fear?” When you come up with an answer, mark it down, and try and think of a few situations which justify why you feel that’s the case, and not some other level, and write those down as well, so you can refer back to them. Then, determine your desires. What depths of the various kinds of intimacy would you like to have? I find that the best way to determine this is to return to the assessment questions and change them around a bit. In what situation would you like to be most comfortable with them? What’s the most important thing you want to share with them? It’s important to note that this could mean moving back as easily as it could forward. Your desires don’t necessarily lead to deeper intimacy, and this is an opportunity to realize that. Finally, mark the level of trust that you think you would need to have with them in order to realize your desires. What would you need to be able to share with them without fear in order to be comfortable at your desired levels of intimacy? Now, you can do this exercise alone, in order to assess your own perceptions and desires, or with a partner to examine where each of you sees the relationship now, and the direction in which each of you would like to take it. Because each mark is attached to memories or situations, the chart provides a means of discussing why each of you sees things the way that you do, and why you want the intimacy which you want. It can be used to take a snapshot of a relationship as it stands, or as a tool to work out long term goals. Something I’d like to stress about this is that marking desires is not an argument that things should be that way, merely an expression of the way in which we want things to be. Think of ice cream. I can want a bowl of ice cream, but that doesn’t necessarily mean that I should have or am able to have one. Nonetheless, it remains true that I want one, and my desire for one is going to affect my behaviour in ice cream-related situations, so it’s a relevant consideration. It’s also relevant to ask why I want ice cream, why I prefer ice cream to other things, and what other things I prefer ice cream to. Similarly, I can desire a kind of intimacy, but that doesn’t necessarily mean that it should or can exist, or that I think that it should. Also, I cannot stress enough the necessity of being as honest as one can when performing these assessments. This is as useful a tool as you let it be, but in the end it’s a method for disciplined introspection. If you’re concerned about whether or not you’re being honest with yourself, I recommend waiting after doing it, and putting it out of your mind. After a few days, do another one without looking at the first, and then compare the two to see how your attitudes have shifted, and try to understand why they might have done that. Saturday I’m going to wrap this up by talking about things we can do when comparing charts with a partner, and other considerations and critiques of this idea. In the meantime, how do you think this could be useful to you in understanding your expectations and desires in relationships? What could be changed about it to make it more useful?